The adult boxelder bug is about one-half inch in length and black, with distinct red wing veins and abdomens. One of my favorite memories with my son is when he was 2 and just getting good at walking. His favorite thing to do was to walk around our block, a task that would take me five minutes on my own, but an hour with him. He had certain things he looked for each time, and we could never rush through his expectations. The highlight of our walk each time, and where I had to prepare to spend a good 20 minutes, was a boxelder tree on the corner of our block. Below the tree, thousands of bright red boxelder bug nymphs crawled through the leaves. Boxelder bugs emerge from hiding places in the spring and lay eggs on the bark and leaves of a host tree. Nymphs born early in the summer may grow and lay another generation of eggs before winter forces them all back into hiding. Alas, this second generation of boxelder bug nymphs we annually observed probably didn’t survive the winter, as only adults can make it through the cold. The adult boxelder bug is about a half-inch in length and black, with distinct red wing veins and abdomens. They are not poisonous, nor do they bite. They are highly specialized in their food source, choosing primarily the female boxelder trees with pods. They are also found on maple and ash trees, but not in as high a number. They use piercing, sucking mouthparts to draw the sap from leaves, flowers and seeds of these host trees, but the bright red nymphs primarily feed on the seeds. However, they don’t seem to actually cause much harm to the trees. As the weather gets colder, adult boxelder bugs look for sunny places to gather. They overwinter under bark, in rocky crevices or in the basements, attics, cracks, windows and walls of homes. Right about now, many people will start to see an abundance of boxelder bugs in their home as this harmless bug looks for warmth and cozy places to hide for the winter. 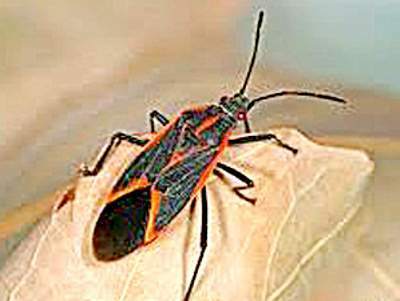 Homes with sunny western or southern exposure are especially attractive to boxelder bugs. Once the cold weather hits, we may not see these household visitors until the next spring when the weather warms up and they come out of their hiding places to crawl around. Although a nuisance, they will not lay eggs inside. They will either get out of the house or die on their own after a couple of days. The boxelder bug seems to have very few predators. Because of their coloring and the slight odor they emit, they are not appealing to birds or other insects. Rodents and spiders will eat them if nothing more desirable is around, but they are not a primary food source for any species that we know about, nor do they provide any service to the trees that they depend on. What to think about this harmless, useless bug? Perhaps the joy and wonder they brought a 2-year-old observing nature at his own pace is reason enough for their existence.